Author: Mistry, Rohinton Set In . . . 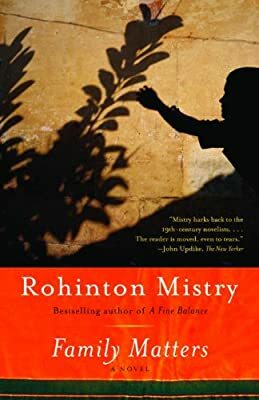 Description: Rohinton Mistry’s enthralling novel is at once a domestic drama and an intently observed portrait of present-day Bombay in all its vitality and corruption. At the age of seventy-nine, Nariman Vakeel, already suffering from Parkinson’s disease, breaks an ankle and finds himself wholly dependent on his family. His step-children, Coomy and Jal, have a spacious apartment (in the inaptly named Chateau Felicity), but are too squeamish and resentful to tend to his physical needs. Nariman must now turn to his younger daughter, Roxana, her husband, Yezad, and their two sons, who share a small, crowded home. Their decision will test not only their material resources but, in surprising ways, all their tolerance, compassion, integrity, and faith. Sweeping and intimate, tragic and mirthful, Family Matters is a work of enormous emotional power.